This larger version of LaBrea's French Baguette uses a softer flour than their sourdough, creating the same thin crust and silken texture. 15 per case, 11.7 oz. The crust of this French Baguette is so fine it crackles when you slice it. Featuring a delicate bubbly interior, great for sandwiches, and a perfect complement along with cheese platters and flavored olive oils. 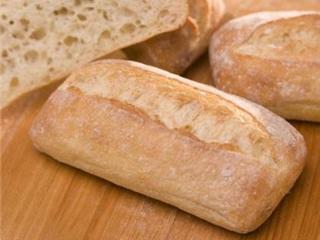 The petite size of the classic French Baguette, the Demi is perfect for a sandwich. Its thin, crisp crust and creamy interior await any sandwich fixings you can imagine. 60 per case - 3.75 oz. 48 per case - 4.5 oz. 6 per case, 8.45 oz. 25 per case, 12 oz. French style 22" white baguette, fully baked to ensure a narrow, classic shape. Hand shaped and scored.